Happy Star is SO EXCITED! 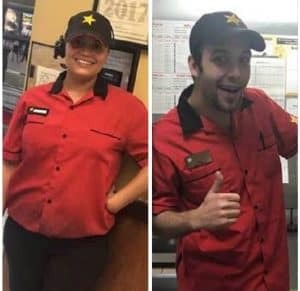 We’ve found more superstar employees in our restaurants. We are proud to recognize these employees from Empire Restaurants in Georgia! Ashley Carr- She is a valuable team member at our Conyers 1 Restaurant in Conyers, GA. She has received many compliments from our Guests from the Guest Survey Program, such as, “She is always so friendly,” and “Ashley makes my visit to the restaurant spectacular!” Thank you, Ashley, for providing SUPERSTAR SERVICE to every Guest and making them feel special! We appreciate all you do! Special Recognition message from Mike Voskia- Empire Restaurants. Congratulations to Ashley & Toni!